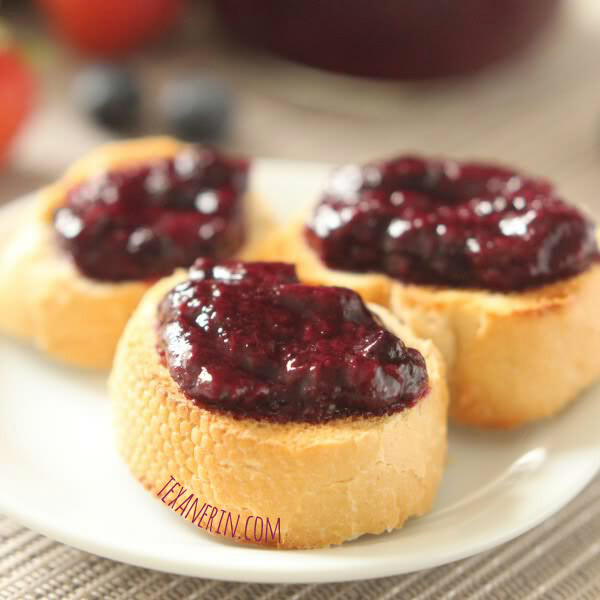 This strawberry blueberry jam is relatively quick and easy to make, honey sweetened and doesn’t contain any pectin! Okay, why are y’all pinning fall baked goods? Stop that! :) Fall is my favorite season, in general and for baking, but it’s still summer and pretty soon all the fruit will be gone and we’ll be stuck with apples. And only apples. Until oranges appear. After our strawberry picking adventure, I made strawberry jam. And loved it. I also made some blueberry strawberry jam. Although it was lovely, I’ve figured out I’m a one-type-of-fruit-per-jam-girl. I also made some strawberry apricot jam. And some other weird combinations. With just one type of fruit, the flavor is just so… vibrant. Like it punches you in the face. That’s what I like. But in case someone out there enjoys a mix of flavors, here you go. Place the strawberries and blueberries in a large pot and smush with the bottom of a glass. For me, this was really easy as mine were really juicy. Add the honey, lemon juice and lemon zest and heat over medium high. Boil, stirring every now and then, until the mixture thickens. With my really soft and juicy berries, this took about 35 minutes. It could take more or less time depending on your berries. To test, put some of the jam on a clean spoon and then put the spoon on a plate in the freezer. Let it sit in there for five minutes and then take it out. If the jam doesn't fall easily off the spoon when you turn it to the side, it's ready and you can take the pot off the heat. If it does pour off easily, continue cooking for another 5 minutes and try the test again. Let cool and then pour into jars and store in the fridge. Yields about a 600ml / 20oz jar. Could be more or less depending on exactly how long you cook the jam. I kept mine in the fridge for 1 1/2 weeks before using it all up and had no problem with it going bad. Mine were smushed because that's how they were when we got home. So go by weight! 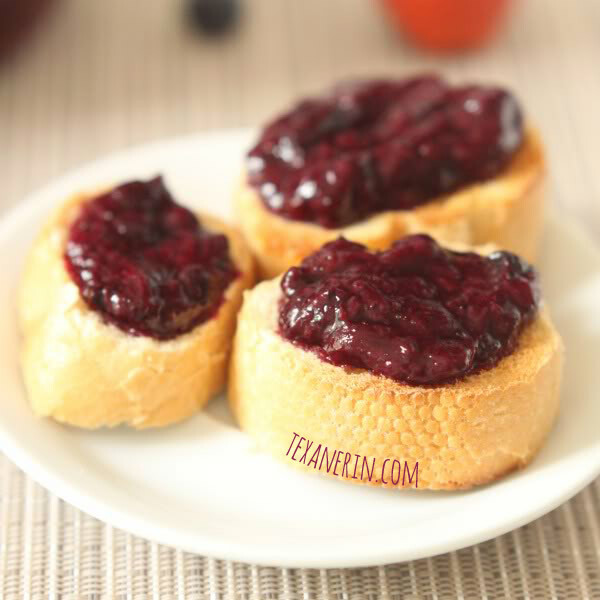 24 comments on “Strawberry Blueberry Jam (honey sweetened, pectin free)” — Add one! I love the technical term smooshed. ;D Combining strawberries and blueberries sounds so delightful!! Christina – I hope to learn how to can soon so that I can do the same! Right now it's just taking up lots of space in my little freezer. Barbara – Thank you! How much sugar do you use in yours? I'd love to see your recipe! Preserving the Vitamin C would be super, but to be honest, I only eat like 1/2 tablespoon at a time so I guess I'm not missing that much. But it would be nice! Marta – Thanks! I hope the berries are still here when you come back. Enjoy your vacation! Oh boy!! I am really enjoying all the berries as well and I hate not having them year round, well the fresh ones that is, because I always stock up on frozen ones :-) I have never made jam, preservers or anything like that, I should. You have really awesome jam recipes and the best part is that they hardly have any added sweetener at all, and you use honey which is the best!! I've just started my holiday, so I feel like it's the beggining of the summer. So hot over here. And actually I'm trying to eat as meny fruits as possible, it's so delicious over here. I hope there will be still strawberries and blueberries when I'm back in Berlin, so I can make some jam. And I love that you used honey to make it sweet!!! I still have not decided if going for the only fruit and long cooking as you propose or stick to my reduced sugar and short cooking time (which preserves vitamin c). you know what? I may actually make a little of both systems. if I manage to find still ok berries which I am not sure at this point of the summer. your jams look soooo good! I only once made jam and that was years ago. I loved it. Your delicious looking pictures really make me want to try this again. Thanks for the inspiration. Becca – Ooh, good girl! :) I know you don't like fruit, so good for trying. Julie – I'm going to make so much next year. Just have to learn how to can first! Alaine – You should try making it again! It's so simple and delicious. Anna – Haha. Seriously, by the time we got home with the public transportation, all billion pounds of strawberries had to be used immediately. Smooshed smooshed smooshed. Jessica – Hope you do! Stephanie – It IS easy. :) I hope you enjoy it if you try it! Love that this doesn't use pectin and seems so easy! I am definitely going to have to try this! Heehee, I love the "smooshed" measurement, that's how I roll :) Fresh berries are definitely to be celebrated before summer is gone! Homemade jam is the best. I haven't made any in so long but this recipe looks ideal. Looks delicious and I love that no pectin is involved! Hope46 – Oh darn. Guess I waited too long to post this! I'm sure using all blueberries will work too. We got strawberries WAY later than in the US so maybe that's why we've still got them around. I hope it works out for you! I might try this with just blueberries, since that's what I've got. Strawberries aren't in season anymore here. :-) Thanks for the recipe!